On our most recent interim assessment, I incorporated two questions about the occupation of the Philippines from Beyond the Bubble. I’ve dabbled in this style question over the last two years, but this was the first time we implemented into across multiple schools on a quarterly assessment. Below I explore question 1, which provides students with a statement about the conflict between the United States and Filipino revolutionaries. Additionally, students are provided with a photograph of imprisioned revolutionaries. This post explores the results in depth, focusing on bright spots, areas for growth, and next steps around the “proficient” and “emerging” responses. 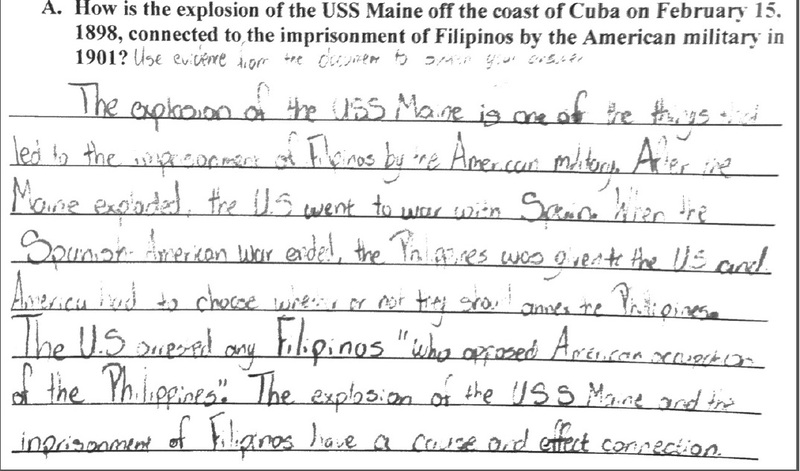 The Question – The question asks “[h]ow is the explosion of the USS Maine off the coast of Cuba on February 15, 1898, connected to the imprisonment of Filipinos by the American military in 1901?” The question assesses students ability to contextualize, corroborate, and apply a general understanding of the Spanish-American War and subsequent Philippine-American War to a specific consequence of the events. Students must use their knowledge to explain how two events are connected. The Results – Using SHEG’s 3-point rubric, the average score for my 76 students was a 1.68 (56%) below “emergent”, but above “basic”. Sixteen students scored a 3 (proficient) and 40 scored 1 (basic). On the same exam, there were 4-5 multiple choice questions on the Spanish-American war and the average on these questions was about 85% across the grade. Obviously, I was initially disappointed in the performance on question A, but I view this question as a diagnostic. That said, the multiple choice questions assess a rather low Depth of Knowledge, while this assessment pushes students to a much higher cognitive level. What do I need to adjust in my class to push their thinking here on a regular basis? Ex. A. Approximately 16 students had answers that should this level of historical analysis. Reading a great answer – a solid three from an eighth grader – made it clear that these assessments are exactly how we should be teaching and assessing history. DF, in Ex. A writes a clear concise answer that walks the reader through her analysis of historical events and closes with evidence from the photograph to complete the argument. DF is a strong student, but not necessarily an outlier. She took her time, annotated the document in a meaningful manner, and drafted a great answer. Students with answers of this level will focus on developing a more nuanced response over the next few weeks – studying the importance of hedging their conclusions with language like “probably” or “likely” to recognize the limits of historical analysis. The most common “emerging” response identified the relationship between the sinking of the Maine and the conflict in the Philippines, but did not “close the door” with evidence and discussion of the revolutionaries imprisonment. These students are very close and for one reason or another fell just short. I am going to take a look at the 40 students with “basic” responses in a later post. Image | This entry was posted in Assessment and tagged commoncore, history, teaching. Bookmark the permalink.